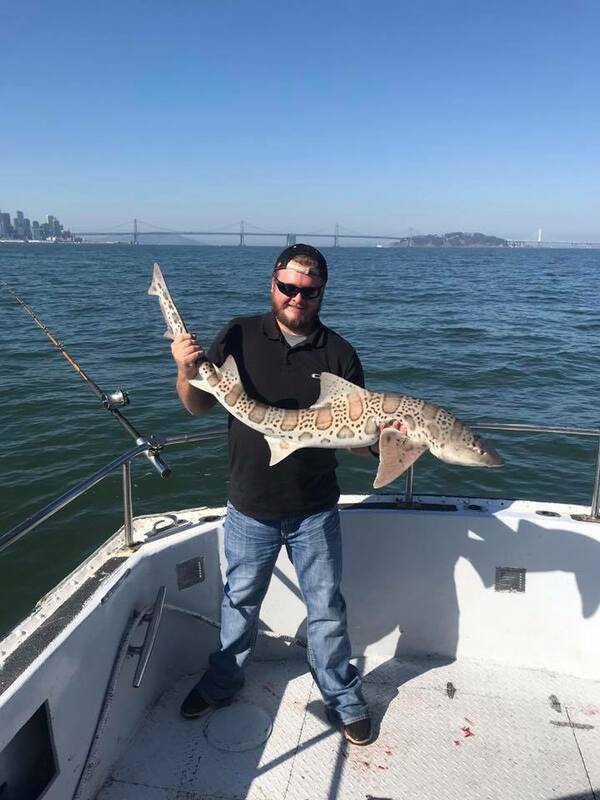 Target sturgeon, halibut, flounder, striped bass, white seabass, rockcod, lingcod, and leopard shark, within the San Francisco and San Pablo Bay. 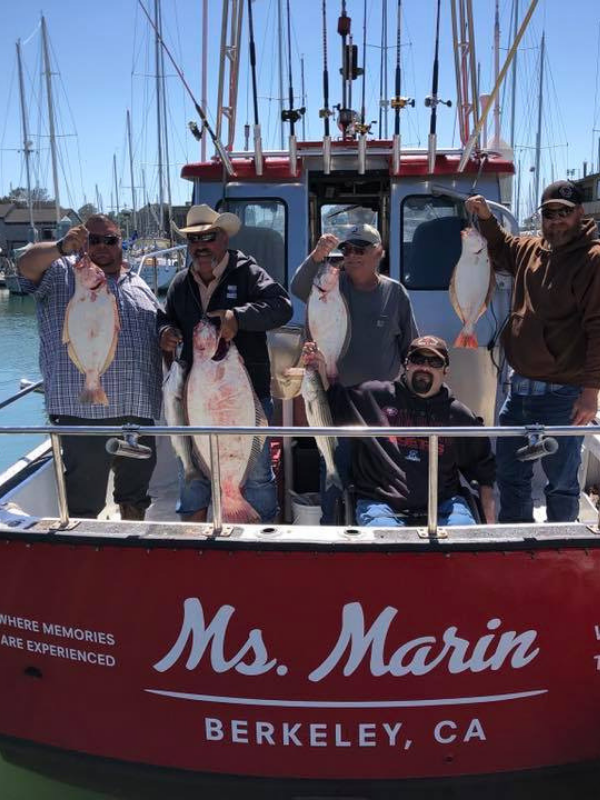 The Ms. Marin runs year round, captained by Chad Aho, and offers charters for all species in season. Captain Chad has decades of experience and knows the perfect places to target. Whether you’re looking to troll the bays or you’re looking for the excitement of the open ocean, we have a tour for you. Shared tickets or private charters are available for full or half day trips inside and outside the bay. All trips include everything needed except your fishing license and your meals. Bay Charter Boats offers more than just fishing trips, for instance, let us drop you off the next time you’re heading to a Giants game. Or head over to San Francisco for the day or just for diner. We can take you there. See the Tours Page for more information. Book the Ms Marin for both Public or Private Charters. Public Charters are ideal for single fisherman, couples, or groups smaller than 6. This is perfect for the angler who is traveling and wants to get in some fishing while they are here. Or maybe you live in town and you’re looking for something new to do? Private Charters are perfect for spending the day with your buddies, family, or coworkers, catching fish while enjoying amazing views. The private charter is a great venue for bachelor parties, reunions, or team building. Maximum 6 passengers. Fishing inside the bay, subject to the time of year and the target fish, Bay Charter Boats takes you to Angel Island, Alcatraz, Berkeley Flats, Alameda, and Oyster Point. On these trips you’ll get a chance to fish halibut, striped bass, white sea bass and leopard sharks or a combination depending on the season; we call it a potluck and use live anchovies as bait. When shark fishing, you’ll get the opportunity to target leopard sharks, soup fin’s, and seven gill’s. Kids under 8 are FREE and Kids under 12 are HALF OFF with a paying adult. We supply all your fishing equipment. Rods. reels, hooks, lures, and bait. When fishing salmon the first two 40 oz sinkers are included in your ticket price. Each additional 40 oz sinker is $7. You will need to purchase a fishing license and sturgeon card (if applicable) before you board. For information on how to purchase click on the “What do I need to bring” question down below. There are no hidden costs. Private and Shared Charters Available. Half day trips range from 5 to 5.5 hours long and leave the dock in the morning and in the afternoon. Morning charters leave at 6:30 am to 12:00 pm and the afternoon charter leaves at 1:00 pm and returns at 6:00 pm. Note: Summer hours will change and we depart earlier at 6:00am. 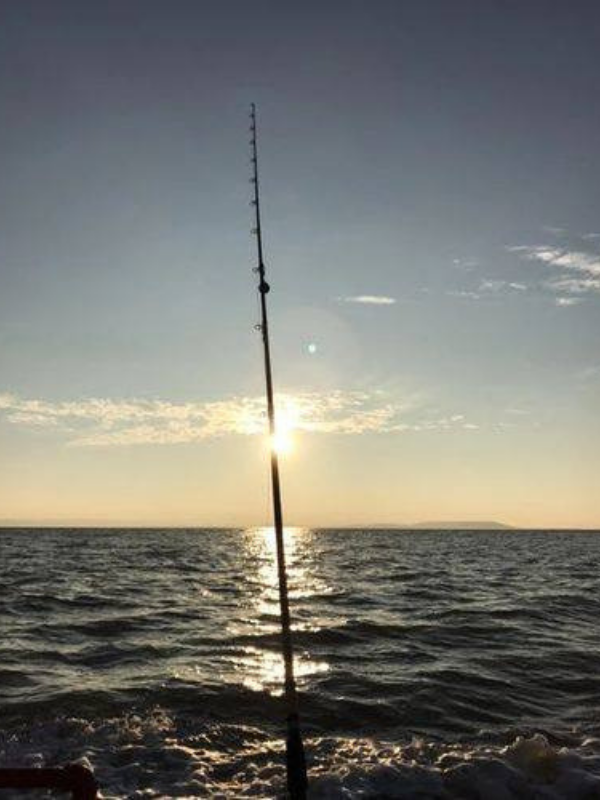 Depending on the season and what fish you want to target, we will explore the San Pablo Bay, Angel Island, Alcatraz, Berkeley Flats, Alameda, and Oyster Point. Full Day Trips are longer and leave the dock at 6:30 am, returning at 3:30 pm and the Ms Marin travels a bit farther since the trip is longer. Note: Summer hours will change and we depart earlier, 6:00am-3:00pm. Venture out and catch salmon and rockfish, and more. Salmon season starts April 13th, 2019. When fishing outside the bay we take a trip up along the northern coast fishing in Muir Beach, Duxbury, and when fishing for rockfish we will go as far Farlons, about 24 miles out. Due to how far out we go there are only full day trips available. The boat departs at 6:00 am and returns at 4:00. We target either lingcod, salmon or rockfish on these trips. Public and Private Charters are available. Maximum 6 passengers. This is your opportunity to enjoy Fleet Week on the water. Enjoy a day of fishing and end the trip just in time to watch the Blue Angels fly over your heads while sitting in the middle of the bay. 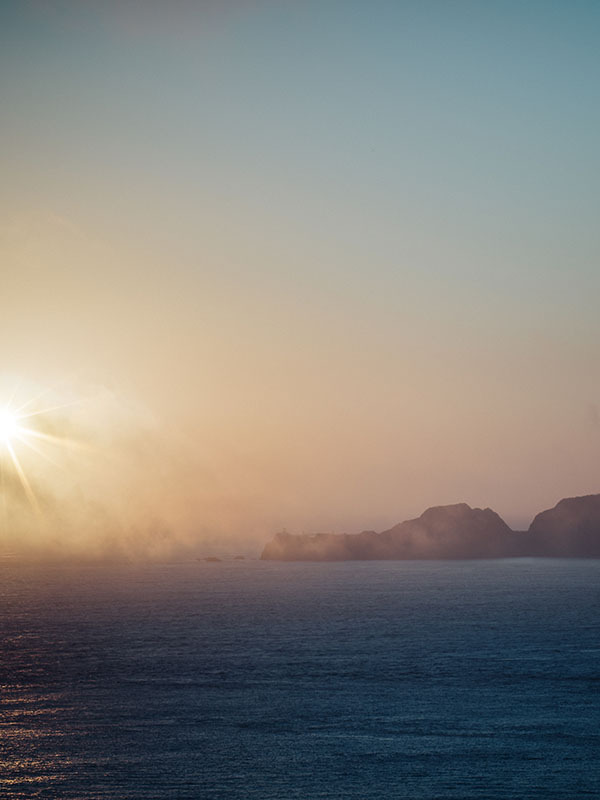 Ready to watch the fireworks from the middle of the bay? Get the best seat in town upon Ms Marin. You can either book a fishing trip and end your day in time for fireworks or you can board just for the evening. It’s your choice. Check out pricing here. The next time you want to watch the Giants play do it from the bay. Sit aboard Ms Marin, float with your friends while listening to your team knock it out of the park. Sit in the area where a home run ball will drop next to you into the bay. McCovey Cove Experience (NO FISHING) for 6 people for San Francisco Giants Game. Departs 1 hour before game time. Book an exclusive fishing trip and enjoy the boat all to yourself! Enjoy a fun-filled day of fishing on the beautiful bay with your family or friends. A special event is the perfect occasion for booking a private charter. Plan your next reunion, bachelor party, or an employee team building trip. Maximum 6 passengers. Private charters have the option to customize their experience such as a full day or half day excursions, Inside and Outside the bay, or targeting specific species. Check out the fun things to do at the marina and around town. We supply all your fishing equipment. Rods. reels, hooks, lures, and bait. When fishing salmon the first two 40oz sinkers are included in your ticket price. Each additional 40 oz sinker is $7. There are no hidden costs. You must have a sturgeon card to fish sturgeon. Limit 1. The Berkeley Marina and Bait Shop sells these. Check the weather! We recommend you dress with layers. Things you can easily take off or put on if need be. When we leave in the morning it can be brisk. So if you can have warmer clothing on and then remove them as the day progresses and the weather warms. Your fishing license. Purchase one here. Sturgeon card if applicable, which can be purchased at the Berkeley Marina and Bait Shop. We require 48 hours of rescheduling or canceling your trip. If you cancel with 48 hours advance notice you will receive a 100% refund. If you cancel within the 48 hours you will receive a refund but you will be charged a 30% cancellation fee.